I've been seeing some wonderful gourd art, so I decided to try my hand (and drill) at it. It took a while for me to figure out how to open the gourd. Then after some false starts I cleaned out the interior. I decided to make a container, so I kept the top for a lid. I experimented with carving faux petroglyphs of bighorn sheep. 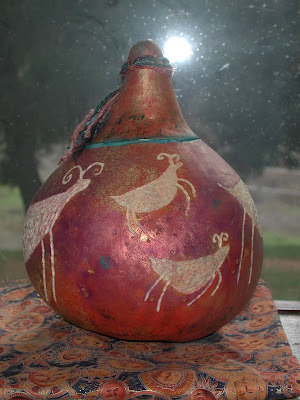 I added stains of purple and red inks, and gold paint with mica chips, to go with the gourd's natural colors. I stamped spirals and added a turquoise accent. I tied some fibers around the lid and tacked them with a spot of glue. Inside, I put some salves and soaps made from native plants (made by a friend, Pinyon Pine Botanicals). OK, I need to try my hand at these again. I've got all the stuff, made a few and then forgot about them. Your gourd makes me want to play with them again! Nice job, Pat. Thank you, Terry. I'd love to see what you make!